At Thew Arnott, we've spent over 150 years providing our customers with the products they need, when they need them. It's a promise we can live up to thanks to an unrivalled combination of experience and expertise backed by a capability to manufacture and source a vast range of ingredients for use in the food, pharma, and cosmetic industries. 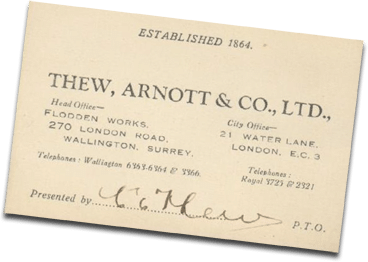 Expertise, service excellence, and added value - that's Thew Arnott. We've come a long way since 1864, but we're still family owned and run and always looking to add value to the service we provide, whether that's through our in-house training provision, our state-of-the-art production facilities, or our ongoing investment in research and technology.